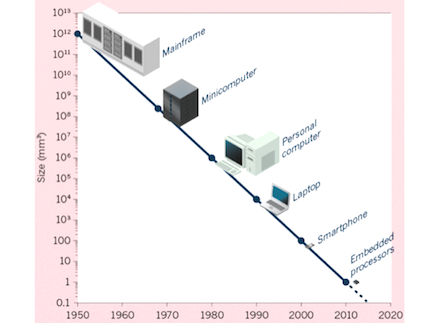 Chris Dixon posted an excellent roadmap for thinking about what is next in computing. My big takeaway from Chris’ post is that these cheap embedded processors are going to be built into everything in the coming years (cars, watches, earpieces, thermostats, etc) and advances in AI will make all the data they produce increasingly useful and disruptive. Chris goes on to tie this megatrend to things like self driving cars, drones, wearables, and VR. While I think all of those things are coming and investable, I wonder if there is something more fundamental in the combination of ubiquitous computing and artificial intelligence that would be the next big computing platform. We are due for one soon. This visual is also from Chris’ post. What is the dos/windows, netscape, and iOS of this coming era? If we can figure that out, then we are onto something. Maybe it looks like this, or this, or this?